The Prospectors & Developers Association of Canada said 2018's convention attendance hit 25,606, the best turn out since 2013. 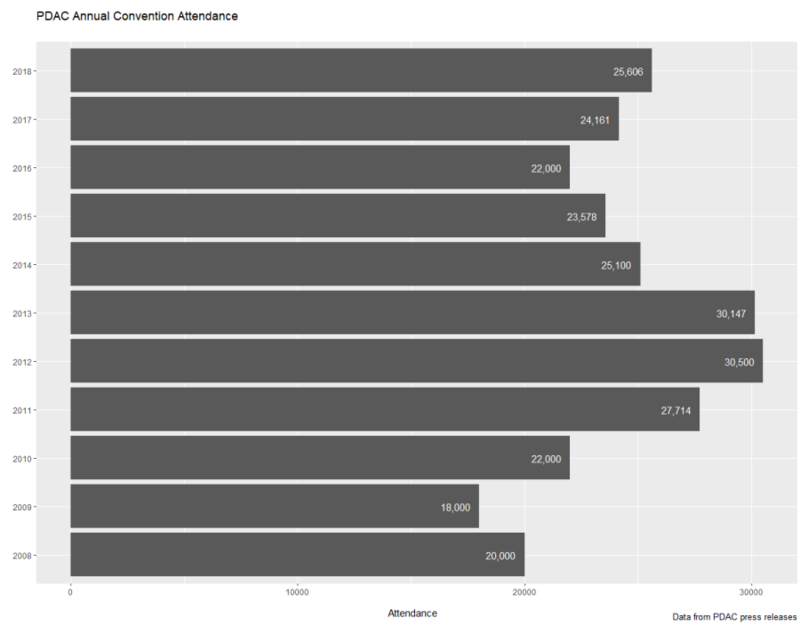 Attendance was still marginally better than last year, just up six percent from 24,161. The PDAC Convention in Toronto, arguably the world's largest annual mining convention, is a bellwether of the industry's health. Participants from 125 countries attend. Organizers said the improved numbers is proof that "mining industry has regained its swagger and is building momentum." With the prices for zinc, copper and battery-related metals all up from last year, miners are enjoying a better top line. This time last year spot copper was US$2.60/lb. Today it is at US$3.10. Zinc is also up 25% to US$1.50/lb and cobalt is up over 50% to US$37.50/lb from a year ago. Money is also flowing into the junior sector. According to PWC, the aggregate market capitalization of the top 100 junior miners hit CA$12.2 billion at the end of June, 2017—up 7% from 12 months earlier. Note that PDAC enthusiasm is tightly linked to the direction of metal prices. 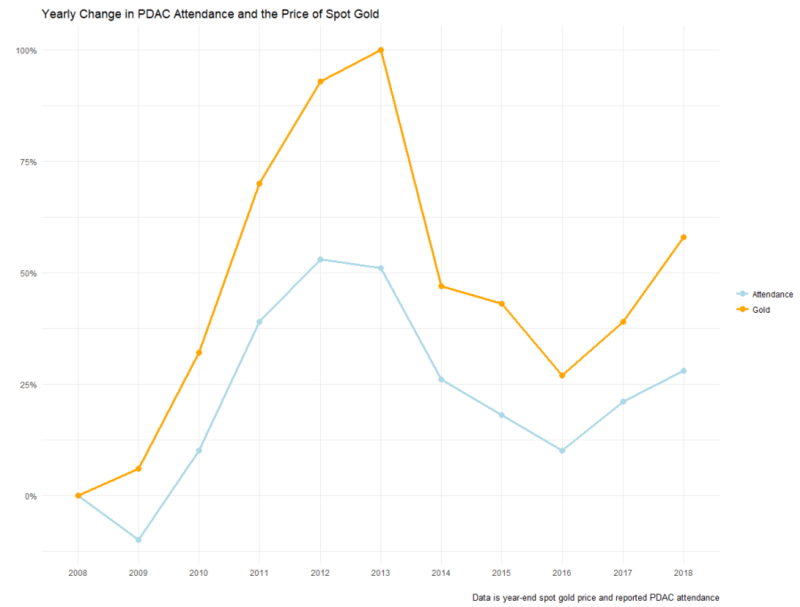 Here's a chart so year-on-year change in spot gold prices versus change in PDAC attendance. Note that gold was at US$1,240/oz a year ago. It is now at around US$1,330/oz. Despite the confidence, worries persist. Active money managers continue to dwindle as money moves to index funds and other passive instruments, said panelists at PDAC's Capital Markets Program. Cannabis and cryptocurrency is getting all the investor attention of those who want to speculate.